How much protein do I need? I’ve been trying to discover the answer to this question. I’ve been on a low carb diet for months now, and I’ve been successful. Recently, however, my weight loss efforts have hit a metaphorical brick wall. Part of this is because I haven’t been able to exercise, due to a knee injury. I think another factor might be that I’m not consuming enough calories, especially I the form of protein. It’s so frustrating! I can eat less than 800 calories a day and not lose an ounce. How is that even possible? I mean, if I slept totally around the clock, I should be burning more calories than that. And when I do splurge on carbs, I pay for it dearly. I overate at an oyster roast the other night and gained eight pounds overnight. Granted, I ate rice and two cupcakes, but eight pounds? Why won’t that process work the other way around? I’ve never lost that much weight overnight. It just doesn’t seem fair. I’ve finally decided I’m not eating enough protein. But how much protein should I eat? How much protein is too much? How much protein do I need? What is protein? Chances are that you already know the answer, but not everyone does. I have some smart friends and family members who don’t have a clue about the difference in proteins, fats, carbohydrates, and fiber. My dear husband is one of those people. Since I’m low carb dieting, I sometimes send him to the store for low carb foods or for the low carb version of certain products. Half the time, he comes home with low fat products instead of low carb products. Big difference! 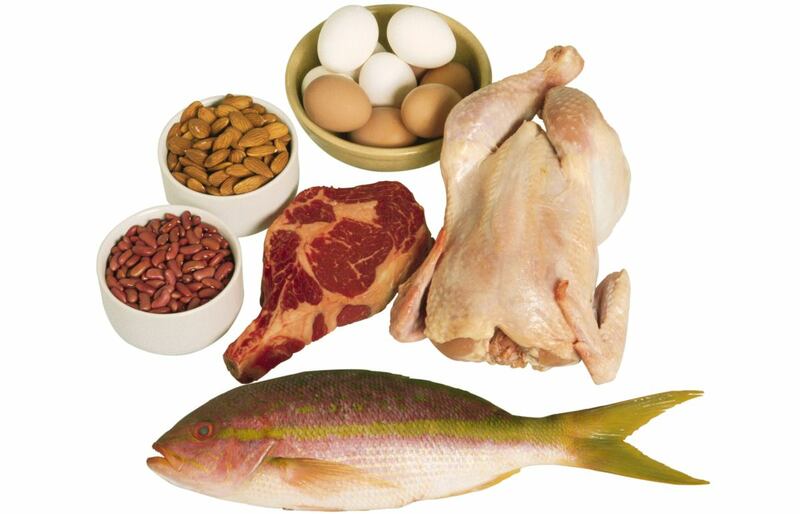 Proteins are molecules made up of amino acids. Amino acids are organic compounds that make up much of our tissues, organs, muscles, and cells. In fact, they’re second only to water when it comes to the composition of these body components. Proteins work hard for us, and they have several roles. One is to serve as enzymes, which cause vital chemical reactions to take place in the body. Our cells couldn’t function without proteins. If we didn’t have motor proteins, our muscles couldn’t work. Proteins and amino acids are building blocks. Structural proteins make cartilage, collagen, and the keratin in our nails and hair. Proteins are also responsible for making necessary repairs to damaged cells. There are twenty-two standard amino acids that humans need. Of that number, nine cannot be made by the body. These are called essential amino acids. Since our bodies can’t produce these, we have to obtain them from consuming foods. One of my favorite protein sources is the egg. I like the taste, and they’re easy and quick to prepare. 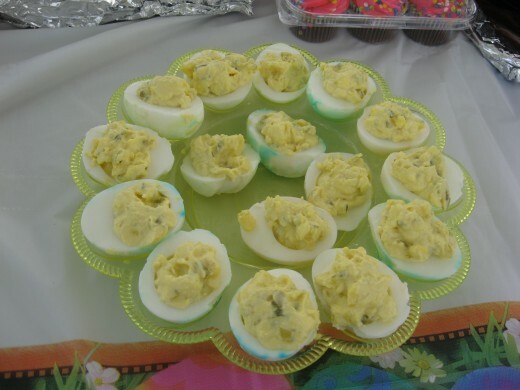 I always try to keep a few hard boiled eggs in the fridge as ready-to-eat, portable high protein snacks. For cooking, I often use egg whites or egg substitute products like Egg Beaters. I can use them to make a quick, healthy omelet in the microwave in just a few minutes. I also use them in frittatas and for scrambled eggs and cheese. How much protein in an egg? A whole large egg has about seven grams of protein. Believe it or not, more than half the protein in eggs is in the whites. Most people think it’s in the yolks – even people who should know better. I’ve heard personal trainers at the gym tell their clients that they need to eat egg yolks because they’re high protein foods. The yolks do have some benefits that the whites lack, but protein isn’t one of them. In my opinion, the whites are a much better caloric value. A large egg has about eighty calories, and the yolk supplies close to sixty of those calories because of its high fat content – not to mention cholesterol. Yes, I know that the American Heart Association has re-thought their take on egg yolks, but I still see more benefit from the whites. You get more protein, no carbs, and no fat for fewer calories. Egg whites are pure protein. That’s why they’re my mainstay on low carb diets. Let’s talk about the yolk for a second. If you’re a healthy adult with normal cholesterol levels, eating an egg yolk or a whole egg a day is usually okay. If you’re going to do so, however, make it a better nutritional value by choosing omega-3 eggs. These are from chickens that have been fed chicken feed containing omega-3 fats. To get the benefit of these healthy fatty acids, you need to consume the yolk. Okay, enough about eggs. Let’s move on to other high protein foods. The best sources of complete proteins are animal products. Of course, the problem with this is that in many cases, you’ll be getting a lot of saturated fat along with the protein. Protein can be obtained from plants, but they’re incomplete proteins. As such, if you want to get enough protein from a vegetarian diet, you need to eat a variety of different plant protein sources. The following tips will help you choose high protein foods that are lower in fats or that contain healthy fats like omega-3 fatty acids. 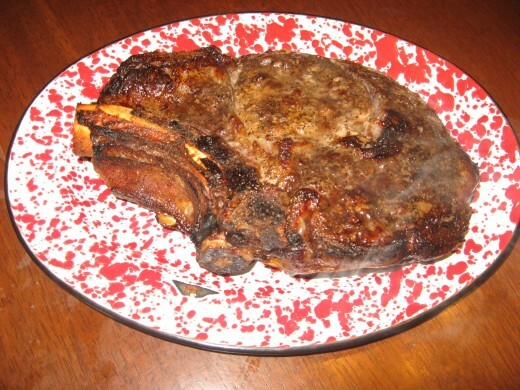 Beef – A three-ounce serving of beef packs 21 grams of protein. Fat depends on the cut or type of beef. The leanest cuts of beef include top sirloin, top round, bottom round, eye of round, and sirloin tip. When you buy ground beef, look for meat that’s 90% or 95% lean. Beef can be tricky when it comes to fat. Even if you trim away all the fat on the outside, there could still be a lot of fat on the inside that can’t be cut off with a knife, thanks to marbling. Generally, lower grades of beef have less marbling, while the highest grade, prime, has the most. We most often choose the select grade because it’s lower in marbling, and because it’s cheaper. Pork – A three-ounce serving of pork delivers around 18 grams of protein. The leanest cuts of pork are the tenderloin, the loin, extra lean ham, and Canadian bacon. If you’re a fan of pork chops, look for chops with little marbling, and trim away the fat layer around the edges. Chicken and turkey – Skinless poultry contains much less fat than pieces with the skin have. Also, white meat has less fat than dark meat. 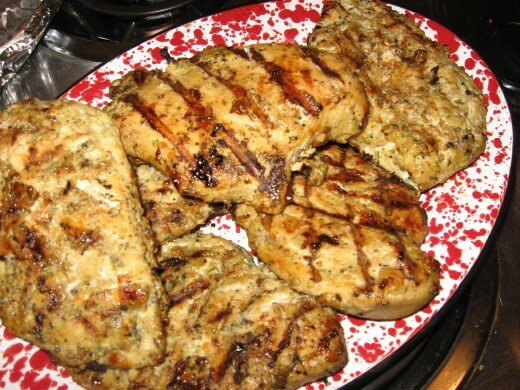 A three-ounce serving of boneless, skinless chicken breast provides 27 grams of protein. Three ounces of skinless turkey breast provides 24 grams of protein. 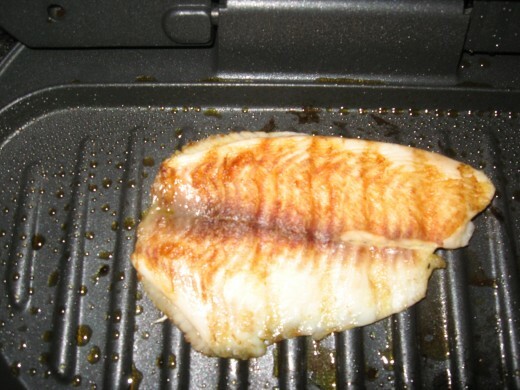 Lean Fishes – Three ounces of lean fish, like tilapia, has just 3 grams of fat and 21 grams of protein. Three ounces of flounder provides the same amount of protein, with just a single gram of fat. Other examples of lean fishes include snapper, cod, orange roughy, halibut, grouper, haddock, catfish, pollock, turbot, monkfish, shark, black drum, sheepshead, pompano, sea trout, cobia, bass, and dolphin or mahi-mahi. Fatty fishes – Most fish higher in fat have the healthy type of fatty acids, omega-3s. These include salmon, bluefish, tuna, sardines, herring, mackerel, anchovies, and trout. To give you an idea of how fatty fishes stack up to lean fishes in the protein department, a three-ounce serving of salmon contains 19 grams of protein. Shrimp – A three-ounce serving of boiled shrimp has 18 grams of protein, 1 gram of fat, and just 84 calories. Of course, if you batter and fry the shrimp, it’s going to have a lot more fat, calories, and carbs. Grilled or pan-seared shrimp is a good low fat option. Scallops – Three ounces of scallops have 18 grams of protein and no fat. Try spraying the scallops with butter-flavored cooking spray and broiling them or sautéing them in a non-stick skillet. Drizzle the scallops with lemon or lime juice. Lobster – If I could eat lobster every day, low carb dieting would be a cinch! Three ounces of lobster meat has 17 grams of protein and just one gram of fat. Dip the chunks in melted butter, and you add a lot of fat and calories. Try dousing the lobster with lemon juice and sprinkling the meat with Old Bay seasoning. Crabmeat – Crabmeat is another winner when it comes to high protein foods that are low in fat. A three-ounce serving has just one fat gram, but it provides 16 grams of protein. Skim milk – A cup of skim milk has 83 calories, no fat, and 8 grams of protein. Unfortunately, milk is fairly high in carbs, with 12 grams per cup. Instead of whole, low fat, or skim milk, I usually drink a low carb milk made by Hood. It’s available in low fat, fat free, and chocolate. You can find it at most Walmart stores. Low fat yogurt – Low fat and fat-free yogurts make healthy snacks. I sometimes eat the Dannon Light & Fit Greek yogurt with double protein. A single-serving container contains 80 calories, no fat, and 12 grams of protein. Cottage cheese – A half-cup serving of lowfat cottage cheese has 1 fat gram and 14 protein grams. Dairy products are also good sources of calcium. Legumes – Dried beans and peas are some of the best sources for protein among non-animal products. Legumes are also low in fat and high in beneficial fiber. A cup of kidney beans, for example, contains 2 grams of fat, 13 grams of protein, and 14 grams of fiber. Pinto beans have 15 grams of protein and the same number of fiber grams in a one-cup serving. Lentils are even higher in protein, coming in at 18 grams per cup. Soy products – Soy products often serve as vegetable protein sources for people who don’t eat meat. Think tofu, edamame, and textured soy protein that’s often used in veggie burgers. A four-ounce serving of edamame has 4 grams of fat and 9 grams of protein, while tofu has 8 grams of protein per four-ounce serving. Nuts and seeds – Nuts and seeds are tasty low carb high protein snacks. They’re high in fiber, vitamins, and minerals, too. It’s true that they contain moderate amounts of fat, but the fats are the healthier An ounce of almonds contains 6 grams of protein and 3 grams of fiber, and an ounce of walnuts has 2 grams of fiber and 4 grams of protein. One ounce of peanuts packs 7 grams of protein and 2 grams of fiber. Pistachios have 6 grams of protein and 3 grams of fiber per ounce. Pumpkin seeds, one of my favorite low carb high protein snacks, has 7 protein grams and one fiber gram per ounce, and sunflower seeds have about the same nutritional value. Whole grains – Quinoa is one of the best protein sources from grains, with 8 grams in a cup of the cooked grain. A cup of dry rolled oats delivers 11 grams of protein and 8 grams of fiber. Cooked spelt serves up 11 grams of protein and 8 grams of dietary fiber per cup, and a cup of cooked amaranth includes 9 protein grams and 5 fiber grams. To cut down on carbs and to increase your intake of protein and fiber even more, switch to whole wheat bread and whole wheat pasta. Protein and weight loss work together in several ways, especially when you substitute some of the carbohydrates you eat with protein foods. That’s how low carb diets work. Protein foods keep you full for a longer period of time, so you’re not as likely to binge on starchy or sugary treats. Proteins also work curbing your appetite because they don’t cause spikes in your blood glucose levels. If you’re a diabetic, that’s a big plus. There have several important studies about protein and weight loss. A couple I read about used two groups of overweight adults and gave all the subjects the same amount of calories each day. One group was given more carb calories, and the other was given more protein calories. The group getting more protein burned about 300 more calories a day. Another study, conducted by the University of Illinois, found that low carb diets that included more protein resulted in more weight loss and more lean muscle. Another way protein and weight loss work together has to do with how our bodies digest nutrients. Fats and simple carbs don’t require a lot of energy for us to process, but protein requires more effort. Our bodies have to work harder and longer to break down proteins and put them to use, and that has an impact on metabolism. If you’re trying to lose weight, increased metabolism is a good thing. Protein powder is often used by athletes, especially bodybuilders who feel they need extra protein to build muscle. Nowadays, however, it’s not just the guys and gals with the bulging muscles who use protein powder. Some folks on low carb diets are turning to it, and I know of some senior citizens who use to help maintain their lean muscle. For vegans, the powder can be an especially good source of complete proteins. Most weightlifters consume protein powder just before and just after a workout. They want their muscles to have access to a good supply of protein in order for them to grow. When athletes are trying to lose fat and maintain or gain muscle tissue, they might use protein powder or protein shakes instead of eating a normal meal. The powder is made from a high protein source, although the sources differ. There’s whey protein powder, egg protein powder, soy protein, and casein. A somewhat new member of the team that’s getting some attention is hemp protein. The common ways to consume the powder is in shakes, smoothies, protein bars, drinks, juices, and water. Protein powders come in assorted flavors. Whey protein powder is made from whey. What’s whey? Isn’t that what Little Miss Muffet was eating with curds? When cheese is being made, a liquid is produced. That’s called whey. Whey protein is made by drying the liquid and sometimes removing all the fats and lactose (sugar) from the milk. When that’s done, it’s pure protein. Whey protein comes in three types: isolates, concentrates, and hydrolysates. The sugars and fats have been removed from isolates, so they’re pure protein. Concentrates, on the other hand, contain small amounts of fats and sugars. Hydrolysates are usually the most expensive forms of why protein. They’re easier to digest because they’ve already been partially broken down. Whey protein powder comes in several flavors, including chocolate, strawberry, vanilla, cookies and cream, fruit punch, banana, and mocha. It also comes unflavored. You can find powdered whey protein in health food stores, at Walmart, and at Kmart. For the largest selection, however, shop online. Egg protein powder is made from eggs – obviously. I devoted a whole section of this article to eggs and egg whites, so you know I’m a fan. Usually, egg protein powder is made from only the albumin, the white part of the eggs, so oftentimes, the powder contains no fat, no cholesterol, and no carbs. It’s all pure protein. Like whey protein powder, egg protein powder comes in different flavors. I’ve found vanilla, vanilla ice cream, chocolate, and strawberry. Of course, you can buy the unflavored version, too. The powder can be added to yogurt, pudding, juices, smoothies, and protein shakes. Some users find the taste a little strange, so you might want to try masking it with other flavors, including no calorie sugar-free fruit syrups. Egg protein powder is harder to find than whey protein powder is. For example, I haven’t seen it in our local Walmart or Kmart, but our health food store has it. You can also order it online. Soy protein powder is made from soybeans and is a good source of protein for vegetarians, as soy is a complete protein that contains all the essential amino acids that the human body needs. To make soy protein powder, the soybeans are ground into meal or flour, the outer coatings of the seeds having been removed. Fats might also be removed. Soy protein powder made from isolates contains very few carbohydrate and fat grams. Some people prefer the soy version of protein powder because the taste is more neutral than that found in whey protein powder and egg protein powder. Some users also report that it dissolves easily when mixed with liquids. 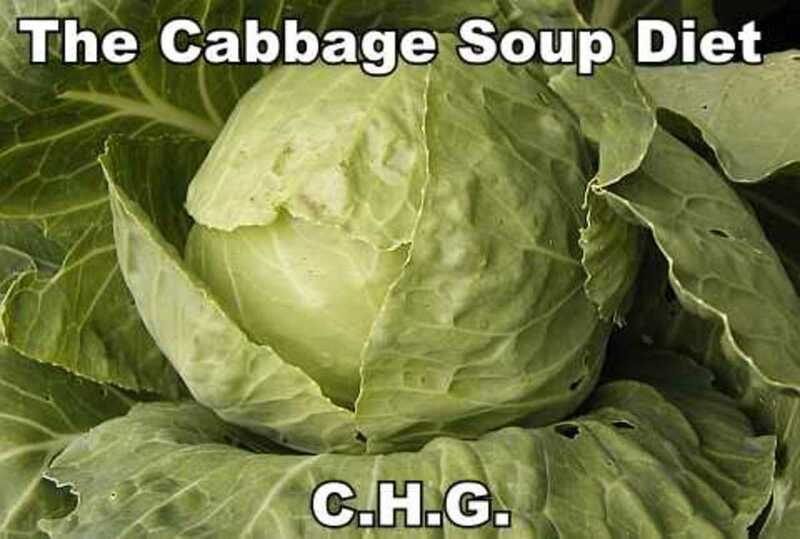 It can be added to just about any food without changing the flavor of the dish. The powder isn’t always easy to find, however. Check out health food stores and nutrition centers in your area. Another good option is to shop online. Soy Protein Powder, 1 lb. Hemp protein can be another good protein source for vegetarians. It’s made from the seeds of hemp plants and provides all the amino acids we need, and that includes the essential amino acids that our bodies can’t metabolize on their own. As you probably already know, hemp is a type of cannabis, as is marijuana. But not all varieties of hemp have psychoactive properties. In fact, there are more than forty varieties that won’t provide a “high,” and those are the ones used to produce fiber, oil, and hemp protein. Most of the hemp protein powder you find contains protein, healthy fiber, and small amounts of fat. It might also contain essential minerals like iron, potassium, zinc, and magnesium, along with vitamins like A, C, E, B6, niacin, and thiamin. It has a pleasant flavor and works well in protein shakes, yogurts, and smoothies. You can also substitute it for part of the flour required in baking recipes. You might also find hemp protein powder in different flavors. Protein shakes can be a quick, handy way to get a boost of protein. Since they can be very portable, drinking protein shakes is a convenient way to down some nutrients when you’re away from home, at the gym or at work. They can be used as meal replacements and snacks, too. You can buy ready-to-drink protein shakes in plastic bottles or cans that are easy to take with you anywhere. They’re usually available in different flavors, like vanilla, strawberry, strawberry banana, chocolate, and dark chocolate. These are pretty “main stream,” so they’re pretty easy to find, even in supermarkets and drugstores. As with most so-called health foods, however, you need to study the labels. Some protein shakes are pure protein, while others contain large amounts of carbohydrates and some fats, but might actually provide little protein. In fact, some really aren’t any better than regular chocolate milk when it comes to health benefits. 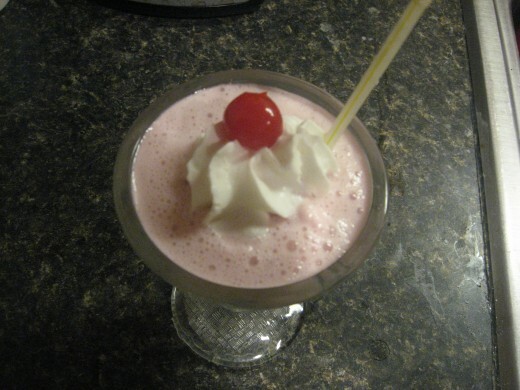 Of course, you can make your shakes as healthy as you like if you make your own with a few protein shake recipes. For protein shake recipes, you can use any type of protein powder – whey protein powder, egg protein powder, soy protein powder, or hemp protein. You’ll most likely find that some types of protein powder work better with certain liquids. You might want to experiment with different types of protein powder until you discover which one works best for you. 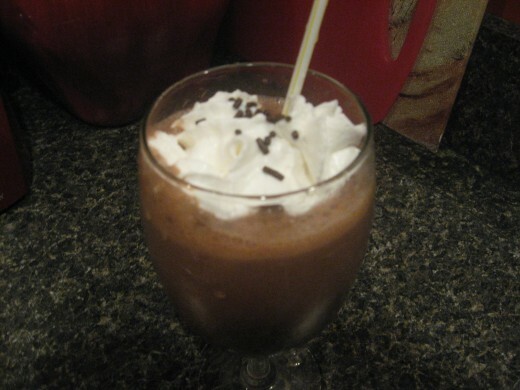 You’ll notice that my protein shake recipes call for crushed ice. That’s because I like for my protein shakes to seem more like actual shakes and not just drinks. 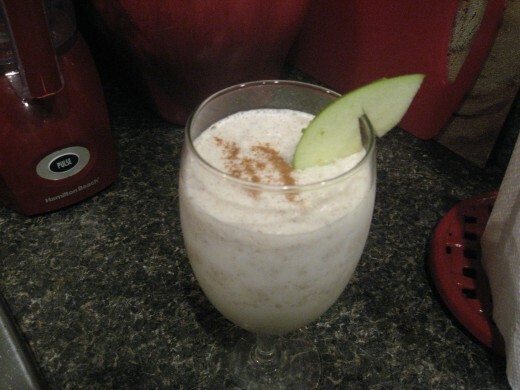 These are good starter recipes for protein shakes. Once you do a little experimenting, you’ll come up with your own favorite recipes. Try different fruits, yogurt, spices, and flavored protein powders. You can also add more flavor and more protein by including peanut butter or nuts. Directions: Add all ingredients to blender. Protein bars can be good sources of protein – or not. I’m a label reader, and I’ve found some so-called high protein bars that are little more than high-priced candy bars. Some actually have more sugar than a comparably sized candy bar, without providing a lot more protein. I don’t want sugar in a protein bar, nor do I want sugar alcohols. Actually, I don’t want a lot of any type of carbohydrates, but I suppose there’s no way to get rid of them all in a protein bar. Besides, if you're trying to "bulk up," you probably won't mind the extra calories. Protein bars come in lots of different flavors, including chocolate, chocolate peanut butter, chocolate mint, chocolate chip, chocolate marshmallow, vanilla, strawberry, apple pie, cookie dough, and other flavors. For low carb diets, choose sugar-free protein bars that are lower in carbs. Just remember to read those labels and do some comparison shopping! How much protein do I need? There’s a huge debate in the doctor and dietician community about this. One standard, from the Centers for Disease control and Prevention, states that men need 56 grams of protein a day, while women need 46 grams. But, according to studies, it’s not always as simple as applying a blanket number to everyone. And, as I’ve already mentioned, some people can benefit from getting more protein in their diets. Some recommendations are based on weight. Remember that study by the University of Illinois I told you about earlier? Those test subjects ate .73 grams of protein per pound of body weight. If you’re overweight, that’s a lot of protein! The University of Pittsburg Medical Center recommends adults get 0.4 grams of protein per pound of body weight. According to many doctors and nutritionists, adults should get between 10% and 35% of their total daily calories in the form of protein. This can get pretty confusing, can’t it? 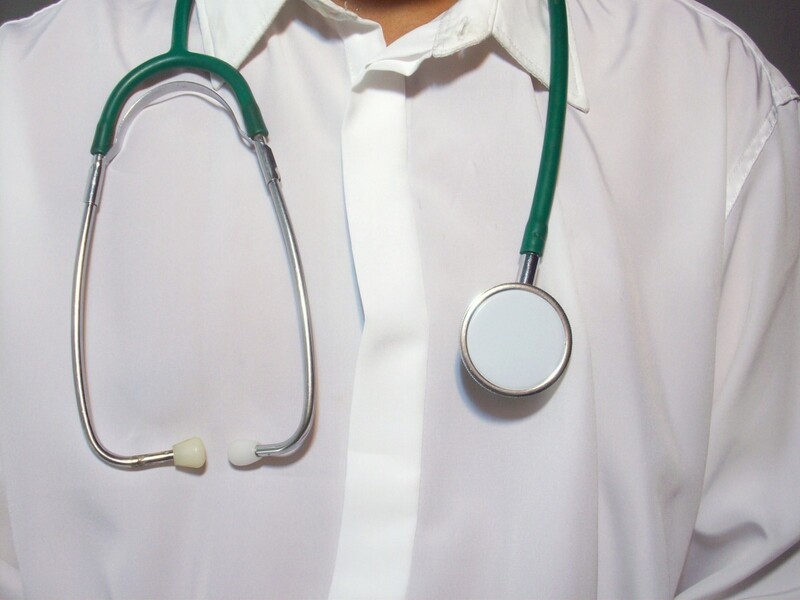 Before going on low carb diets and increasing your protein amounts, it’s a good idea to talk to your doctor. You might have some underlying liver or kidney problems that you don’t even know about. If that’s the case, too much protein could be harmful instead of beneficial. How much protein do I need has been a big question for me. Can you get too much protein? How much protein is too much? There’s really no easy, across-the-board answer to these questions, especially since there’s no hard and fast agreement on just how much is the right amount of daily protein. I’ve seen this with my own doctors. One was worried about my consuming too much protein on low carb diets, while another felt that as long as my kidneys were healthy, she didn’t see a problem with increasing my protein consumption. I mean, I’ve never “gone crazy” with proteins, but they do make up a substantial part of my daily diet. It’s not so much that I eat a lot more protein than I did before low carb dieting – I mostly just eat a lot fewer simple carbs. I do eat a little more protein now, however, so I have been concerned about how much protein is too much. According to Madelyn Fernstrom, the director of the University of Pittsburg’s Weight Management Center, eating too much protein is usually only problematic for individuals with impaired liver or kidney function. As I’ve already mentioned, my personal physician feels the same way. How much protein is too much might also depend on the type of protein sources you consume. For example, some meat sources can deliver a lot of saturated fats and/or cholesterol along with the protein, so taking the overall nutritional information of a food into account is important. Don’t just look at the protein grams the food delivers. Check out the fat and what type of fat is delivered, too. I’ve learned to do this when I’m low carb dieting. Talk to your doctor, do some research, and use some common sense when trying to decide your optimum protein requirement. Do what I did when I asked myself how much protein do I need. Don't call it a low-carb diet; it's really about high-protien! I agree with you that egg whites are a really good source of protein; I include them in my daily diet. Eggs are cheap, quick to prepare, and keep me quite full for a long period of time, curbing my snacking habits. I also get protein from liver and fresh fish. I think it's important to get protein from a variety of foods. I used to use whey protein (when I was skinny) to help me gain muscle mass. The problem was, I put on too much weight in a very short amount of time and ended up with quite sever looking stretch marks that now run the full length of my biceps. Good protein is hard to find and becomes very boring after a while. I agree that cutting out refined and high sugar items are essential, but I'm not convinced that complex carbs are bad for you. Beans and rice are both high carb, but combined, they deliver a great tasting source of complete protein. If you add some meat for flavor, you have a great little casserole. I read somewhere that using meat as a flavoring instead of the main course is the way to go. Now, if I could only convince my husband of this. What a great hub, very informative indeed. Voted up and useful. Thanks, TL. Glad you stopped by! Doc, you are just too kind. it actually does relate to weight loss. You did do your protein homework, Holle. And your photos, as always, are perfect. Thanks for all that hard work, m'dear.